I love having guests stay with us. Most of my guests make it a point to stop over just to see us!! I want them to feel as welcome as possible. 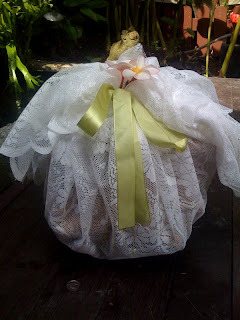 A Guest Basket is always so impressive and the great thing about these baskets are that you can prepare them in advance, tie them up with a cloth to keep out the dirt. Put in all the stuff you can find when you stay in a hotel and more, a scented tealight candle, personalised guest soaps (anything between 15gms to 50gms) and a sprig of flower to make everything feel fresh. I put in two bars, one for the basin and one for the shower. 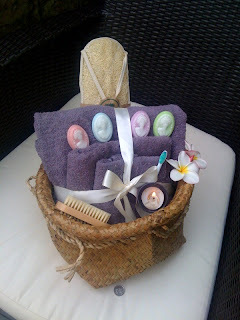 Your guest will feel sooo special and it only takes you a few minutes to pull out that ready made basket!